The trending in Little Falls, NJ is showing that more home owners are remodeling or adding onto their existing home rather than shop for a new home. Parents are opting to age in place where their children are living with them or near to them. A very popular upgrade to older homes is a new more efficient central HVAC system or a Mitsubishi ductless heating unit which is recommended for that particular area of the home that just does not stay comfortable during the cold winter months or the heat of summer. This is an investment not only in your quality of life but will add to the resale value of your home. Bloomfield Cooling, Heating and Electric, Inc. is a full service HVAC company that services Little Falls and all of northern New Jersey. We can evaluate your existing system and recommend maintenance and repair options or we can install a completely new system. If your heating system less is than 15 years old, it just might be time for an expert to come and perform a routine maintenance check-up which will prolong the life of your system as well as keep it running more efficiently. Why You should Choose Our Company for all of Your HVAC needs in Little Falls, NJ. We have been in business for 27 years servicing Essex, Passaic, Bergen and Hudson counties. We are family owned and operated. Our staff and technicians are all factory certified professionals and our electricians are licensed. We are fully licensed and insured for the services we provide. At Bloomfield Cooling, Heating and Electric, Inc. we are able to repair, maintain or install an entirely new system. We are able to customize the ductwork that is necessary for the top brand heating systems such as Carrier and we also install and service Crown Boilers and ductless Mitsubishi heating systems. We are currently offering a price break on our Heating Tune Up package. This is a value worth ($ 149.99) for ($ 89.99). At Bloomfield Cooling, Heating and Electric, Inc., we believe in preventative maintenance. This not only helps to extend the life of your heating system, It also helps the system to run more efficiently. Once you have experienced our “White Glove” customer service you will ask yourself, why didn’t I call sooner? 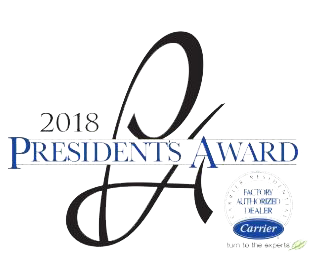 We recently received the Carrier “President’s Award”. We have been recognized by Angie’s List for the last 10 years and for the last 2 years the reader’s of Suburban Essex Magazine have awarded us the Gold “Reader’s Choice” Award. Not to mention all of the loyal customers we have serviced since 1989 never hesitate to recommend us to their own family and friends. Check our Google reviews – we are very proud of them. Our professional customer service representatives are ready to assist you with your heating needs. Give us a call today – 973-237-0505 or online at www.BloomfieldCooling.com.